It very hard to imagine a large foundry right in the centre of Exeter and yet hundreds, maybe thousands of pedestrians walk, on their way into and out of the Guildhall Shopping Centre, over the site where it once stood. 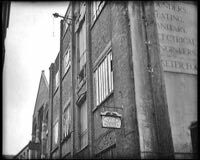 Just under 80 years ago it was in full production and the premises were still standing in is1962, demolition commenced in 1963. So where exactly was it, what did it look like and what sort of products were made there? If you can imagine you are looking directly at the main entrance into WILCO (or, to the mature readers, Woolworths last Exeter Store) you would be standing in the centre of the foundry and if you were to travel back in time, say 100 years, you would find yourself in an unrecognisable environment. An environment that jarred the senses with a great deal of noise, some obnoxious and sulphurous smells, a filthy, dingy and extremely hot workplace where the cupola frequently issued forth molten metal. There are three storeys above you and a workforce of maybe a hundred plus involved in a variety of skills all directly connected with the pouring, casting and finishing of mainly cast iron products. I have put on this page the only two images I have of the foundry which gives us a clue as to what the inside looked like. 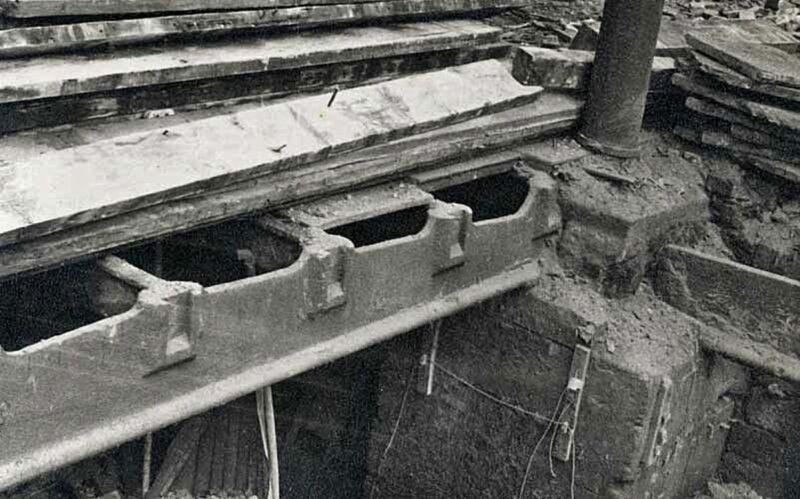 The Cupola in the first image is a Stave Cupola which is built up of cast iron segments and held together like the staves of a barrel Two images show the Waterbeer Street side of the Foundry taken in 1935. 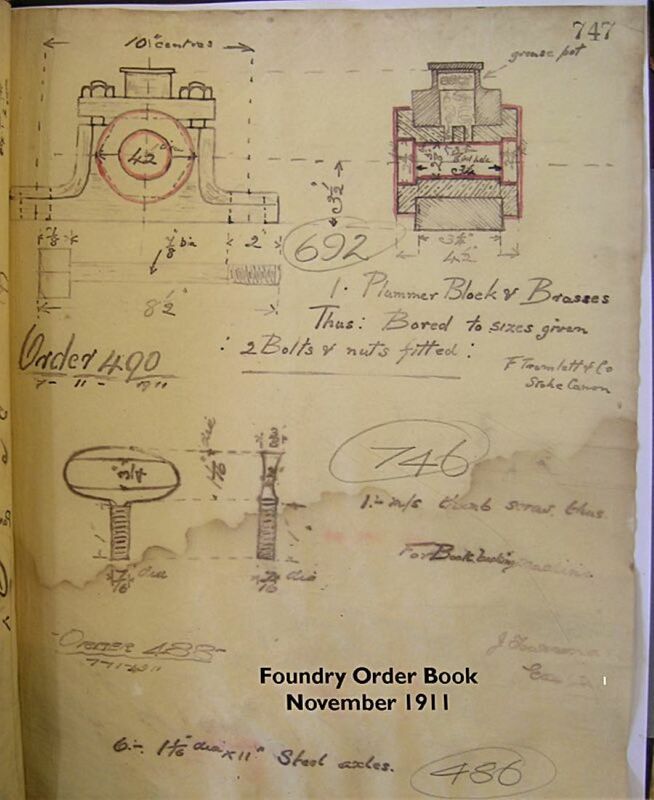 The Foundry Book for 1918 through to the early 1920s still exists – a copy of one of the pages you will find here and its dated 9th July 1918. 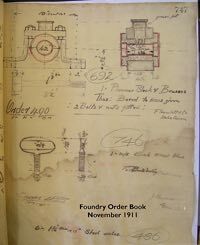 This is a typical Foundry Cost Book, nothing much to do with the Customer or what they might be charged. It would have been kept in the Waterbeer Foundry Office. No 2: Job or catalogue/category number probably. No 4: Weight of casting (Cwts, Qtrs. Lbs). No 5: The amount of Piecework (£ - s – d) earned by the moulder based on the time allowed for the job. 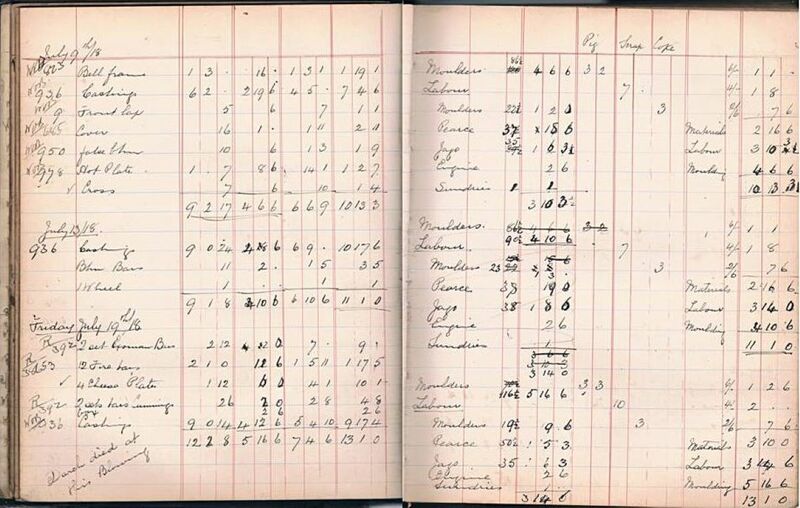 No 6: The material cost (£ - s – d) being the weight x the per Cwt rate shown in Shillings and Pence in the first column on the right hand page. On the right hand page – columns 2, 3 & 4 first shows the total moulders piecework, then below it the amount paid to the moulders for the time they had to spend on general labouring, below that the wages for each of the foundry labourers. Over on the right is the costs of pig iron, scrap and coke used, added with the moulders’ and the labourers’ pay totals to give the Grand Total Cost for the day. On the first column on the left page each line seems to have been overwritten with some initials – ‘WOB’, quite what the significance of this is I’m uncertain – someone double checking the entry or signing it off perhaps? The Foundry Book also gives us a glimpse of some of the staff at the foundry during the period 1918 – 1923. The surnames Pierce (22 Paul Street), Jago, Clarke and Rice occur – all Moulders. Other names that appear are Clatworthy, Sheppard, Norman. Dingle, Darke, Walters, Field, Lang & Copp. There is no indication given as to their skills or areas of expertise. 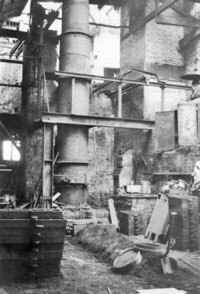 slate slabs, so making a fireproof floor above the molten metal of the foundry, this was used as a wareroom for storing items for the various departments (pipe fittings electrical goods later on semi finished products for and from the smiths etc. 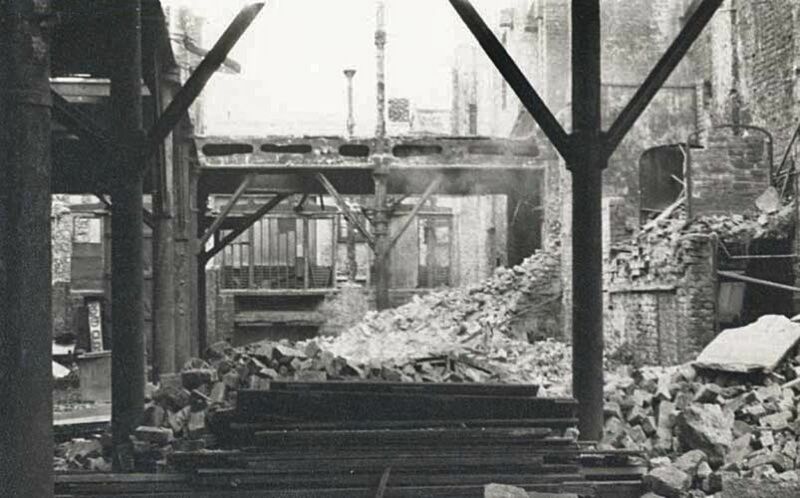 (See Images here, courtesy West Country Studies Library, taken when the building was being demolished in 1963). 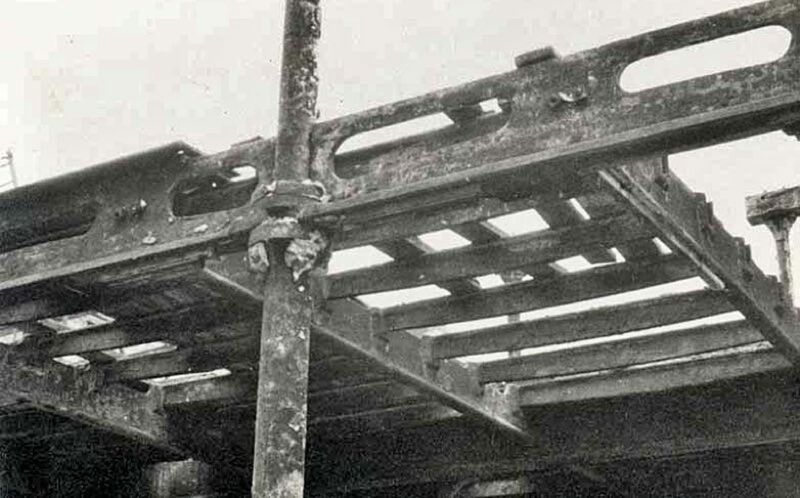 The second floor was a timber one carried on wood joists with oak main beams about 30” x 18” section and well seasoned so that you could only drive a nail in perhaps ½”. This floor was originally used by the whitesmiths making tinned iron copper, tin vessels also leadwork etc. In the 1920 / 1930 there was a plumber and a tinsmith. On the West side there was a long thick and ancient bench on which had originally stood the five or six small braziers in which they heated their irons for soldering or pots of lead for wiping joints. Then above the second floor was a roof space, into which had been put patterns not in general use. I think the pattern maker also used part of the second floor, where we also had lathes and drills, which were used by the smiths and one turner. The blower for the cupola was originally driven by a gas engine which with shafting, belts and pulleys also drove the lathes, drills etc. By the 1920s electric motors provided the power. Also at the Waterbeer street end all floors had opening doors to enable the hand crane (chain type) to load and unload items from the street to and from each floor. The crane mechanism was in an extended roof space also with an opening so verbal instructions given from below could be heard. When melting was being carried out the smoke from the Cupola occasionally descended like a fog in the High Street or Waterbeer Street or the Guildhall; but as our business had been there almost as long as the Guildhall we got away with this and of course there were no Environmental Laws on the subject. The Cupola was hand filled from a stage equipped with a hand crane, later electric, bringing raw materials up from the cellars to the loading platform. 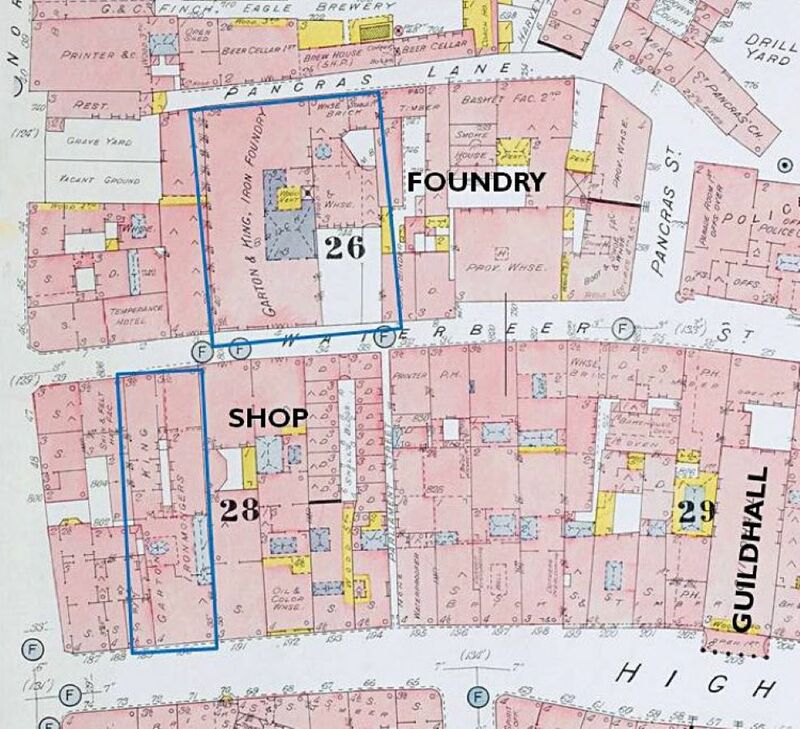 About 1935 a notice of Compulsory Order purchasing the Waterbeer Street Foundry arrived from the City Council as they required the whole area for a scheme for a new Civic Centre. 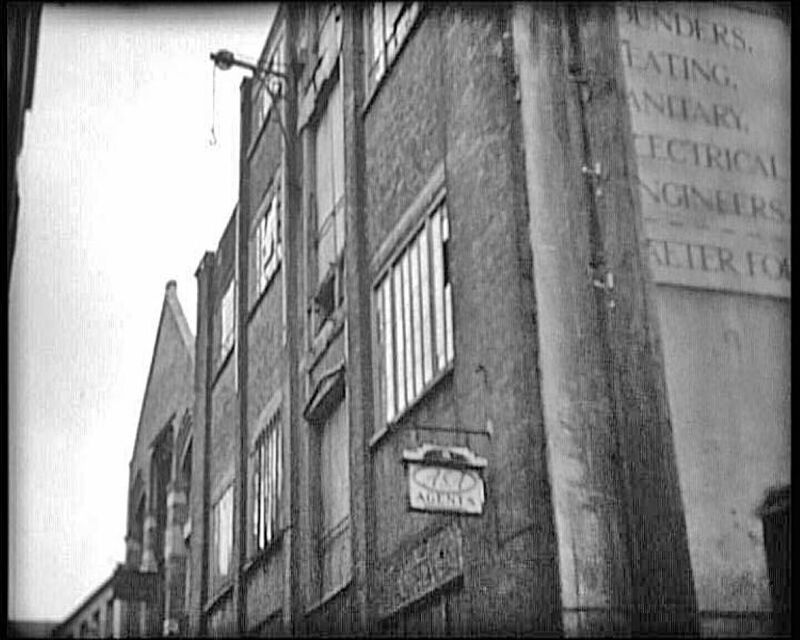 (the foundry was eventually demolished in 1963 some 28 years later!) Compensation was negotiated, Newman was the Town Clerk at the time and after some posturing a figure was agreed. Waterbeer Street. All iron is Cast Iron. 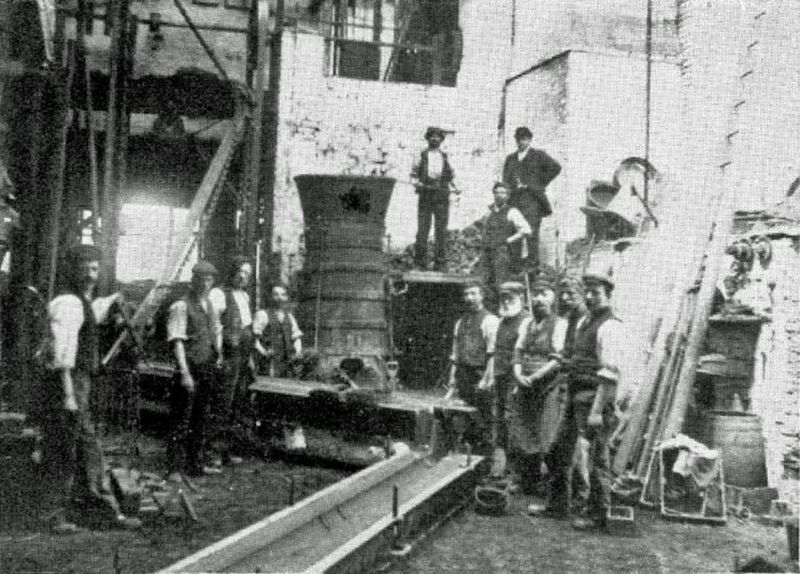 Having agreed compensation, the Council required the building pulled down, to which the company were not averse to doing as a considerable quantity of scrap cast iron would be recovered (see images) but on the West side of the foundry the adjoining property, not having a side wall relied upon the foundry wall to keep it up. It was agreed that the properties on either side of the foundry would be demolished first, the Council witholding a sum in retention until the work was completed. 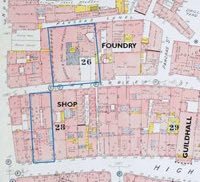 12 months after the foundry had been vacated (by now 1940) the buildings had still not been demolished and the Council grudgingly released the sum held in retention. 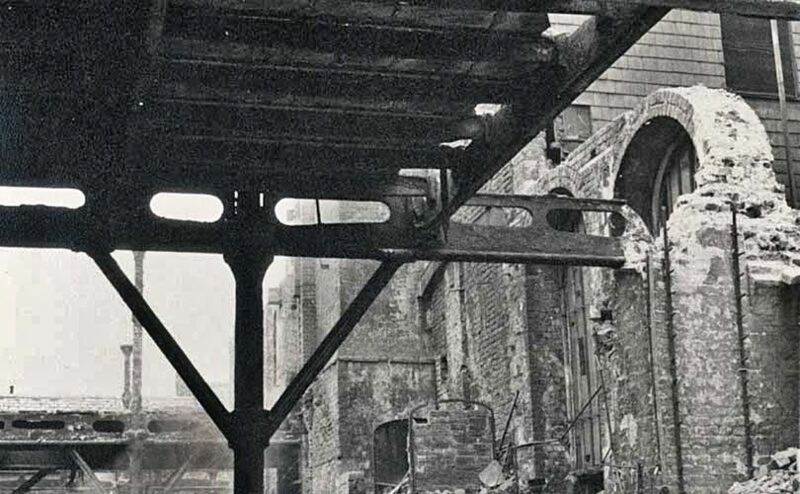 By July 1935 the Waterbeer Street Foundry had been cleared and Garton & Kings long connection with Waterbeer Street was finally ended.